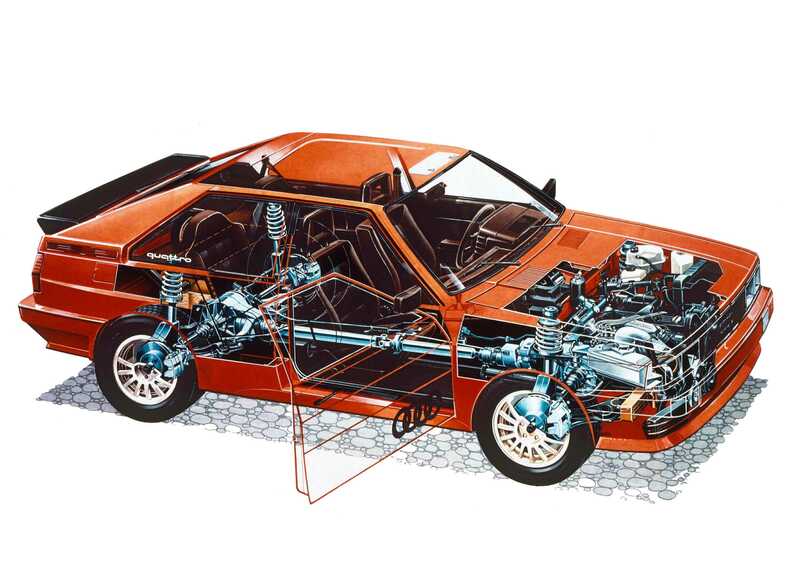 Subaru is the byword for all-weather performance cars these days, but back in the ‘80s Audi got the trend going with its legendary (and legendarily crude) Quattro. We battled two of them to see how they compare now. We found ourselves up at Team O’Neil Rally School in the depths of snowy winter not that long ago and couldn’t miss the opportunity to run one of the school’s Audi 4000 S Quattros. This car has Audi’s classic 2.2-liter, iron-block inline five-cylinder engine mounted completely ahead of the front axle, so long that the radiator only covers the passenger side of the car. It might only make a hundred-odd horsepower, but its early Quattro all-wheel drive system has locking center and rear mechanical differentials. Manually locking diffs are crazy to have in a car. This Audi is built like a truck. Also, it kind of feels like one. The front diff is open, if you’re curious. The Subaru is not so different in its layout. The engine sits front to back like in the Audi with its transmission mounted right off the back of it, but it’s a 2.5-liter flat four with something nearer to 170 horsepower. Its all-wheel-drive system sends power to open differentials front and rear through a viscous center differential. That means there’s fluid that distributes power, rather than a direct physical, mechanical connection like you get in the Audi. Here’s a brochure graphic for the 1989 Subaru Legacy, but it shows the same mechanical AWD layout as the Impreza we had. It’s clear why there’s still such a huge following for these brutally competent Audis, and it’s also clear why nobody builds a car as thuggish as this anymore.